I called Miguel after work to let him know I was headed to the gym. He wasn't very excited. Then again, neither was I. I got to the gym and was taking off my work shoes in the locker room when I started thinking about spending the whole evening with Miguel and our kids instead. I put my shoes back on and headed out the door. I just wasn't into it. I got in my car and was driving out of the parking lot when in comes one of my mom friends (Hi Alison!!) who has recently started exercising. Oh boy, I have to go back in. She's at the beginning of her journey, still in those early weeks where she doesn't yet get the energy boost that comes from exercise. But she's doing it and I just couldn't let myself drive away after seeing her. So I re-parked my car and went back in. Alison and I got to chat a little bit and then I went to do my thing on the upright bike. After, I did back/biceps/core work and then some nice stretching. When I left I still felt 50/50 about my workout but at least, in the end anyway, I erred on the side of fitness. And when I walked in the door at home both kids squealed and I got big hugs. I'm excited to spend the next few days with them over this holiday weekend. And now I'm glad I went to the gym. Speaking of this weekend... Miguel is working tomorrow and that means no long run...or does it? Earlier this week I emailed my mom friends to see if anyone would have my kids over for a playdate while I do my run. Fortunately this is a step-back week and I'm only running 6 miles. Several offered to help. I have the best mom friends! So we're all headed to Monique's tomorrow and while the kids are playing (peacefully, I hope), I'll get to do my run. Thank you Monique!! (looking forward to returning the favor). Then Sunday will be a family day. I'll go to the gym while the kids are napping in the afternoon. Today was weigh-in Friday and I'm up .2 pounds. I'm fine with that. I've been losing every week for a while now so a miniscule gain is nothing to worry about. 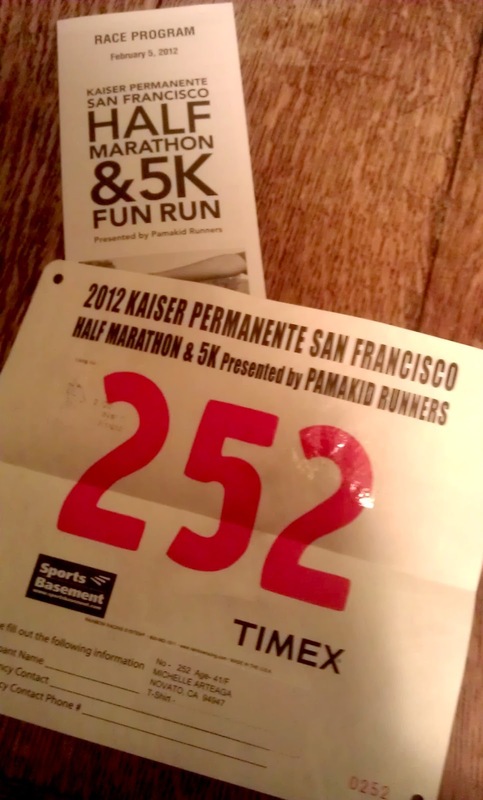 So my race bib arrive in the mail!! I'm getting excited. The neat thing is when I think about the race I have this calm sense of just running and running and running - but without stress. I think because that's how my long runs feel. Just run. Well, that's it for me. If this is a holiday weekend for you I hope it's filled with lots of fun, active and healthy stuff!